Location. 43° 4.138′ N, 89° 24.714′ W. Marker is in Madison, Wisconsin, in Dane County. Marker is at the intersection of Monroe Street and Regent Street, on the right when traveling south on Monroe Street. Touch for map. 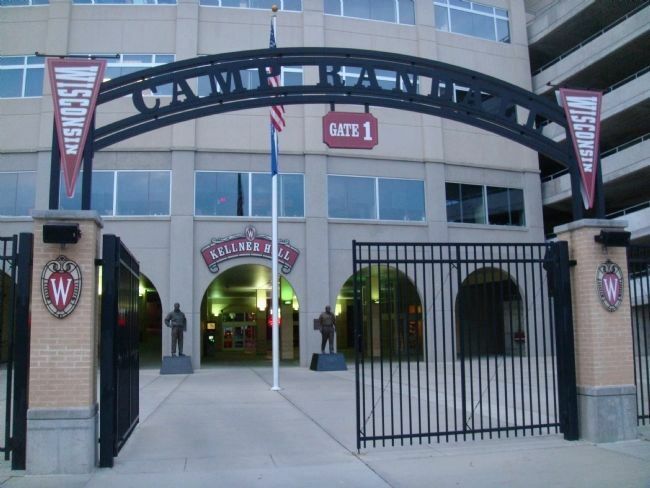 The marker is to the right of the entrance to Kellner Hall at Gate 1 of the Camp Randall football stadium, behind the statue of Barry Alvarez. Marker is at or near this postal address: 1440 Monroe Street, Madison WI 53711, United States of America. Touch for directions. 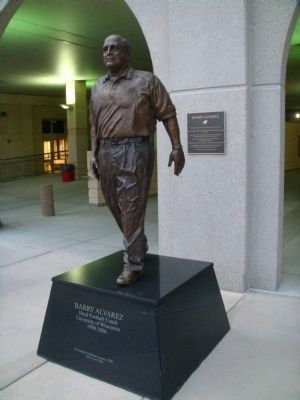 The marker is behind the statue of Barry Alvarez. markers are within walking distance of this marker. Pat Richter (here, next to this marker); University of Wisconsin Field House (within shouting distance of this marker); Camp Randall (about 600 feet away, measured in a direct line); Terrace Homes Apartments (approx. 0.2 miles away); Fire Station #4 (approx. 0.2 miles away); Edward Klief Park (approx. 0.3 miles away); Ely House (approx. 0.3 miles away); Smith-Ogg House (approx. 0.3 miles away). Touch for a list and map of all markers in Madison. Kellner Hall is the home of the UW Athletic Department. 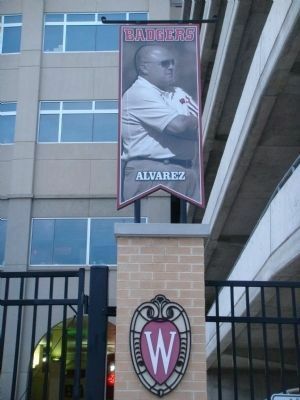 The Barry Alvarez statue and marker are to the right of the entrance. This pennant is to the right of Gate 1. More. Search the internet for Barry Alvarez. Credits. This page was last revised on June 16, 2016. This page originally submitted on August 6, 2011, by William J. Toman of Green Lake, Wisconsin. This page has been viewed 620 times since then and 5 times this year. Photos: 1, 2, 3, 4. submitted on August 6, 2011, by William J. Toman of Green Lake, Wisconsin.